Time for what you say? Seeds have been ordered and delivered, planting pots and trays are out of storage and at the ready. All I need is a bag or two of seed potting medium and I am ready to roll! That is the day I start my peppers seeds. 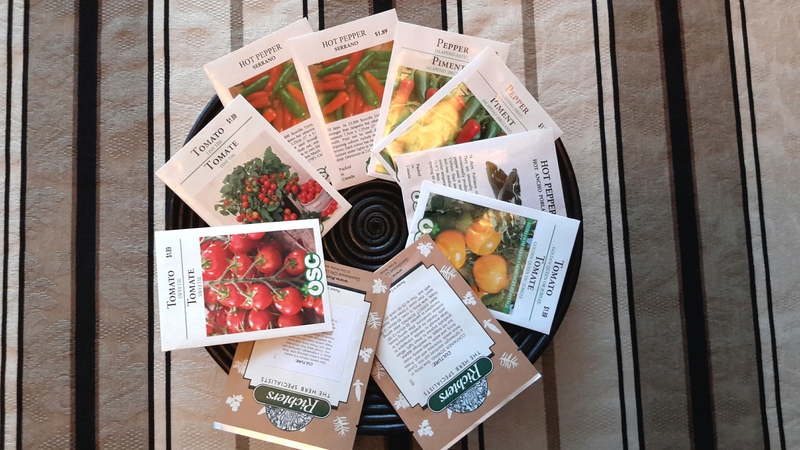 Let year I decided to start the peppers a month earlier than the Toms as they are slower growing and I have found they take longer to mature and fruit in the shorter growing season of the Northern Homestead. Boy did it work out fabulous as they were fruiting 3 weeks earlier than the year before. I planted them in the raised beds the end of April keeping the plastic rolled down for the greenhouse effect until after the last frost date to which they responded by growing into tall, sturdy plants loaded with fruit being harvested in a much shorter time. So for now, the days count down slowly as I anxiously await the 15th of February to get my little charges into their new little peat pot homes. Yippee! What will you grow this year? Remember Fuerig? The black baby alpaca fibre I received back in the early Spring? 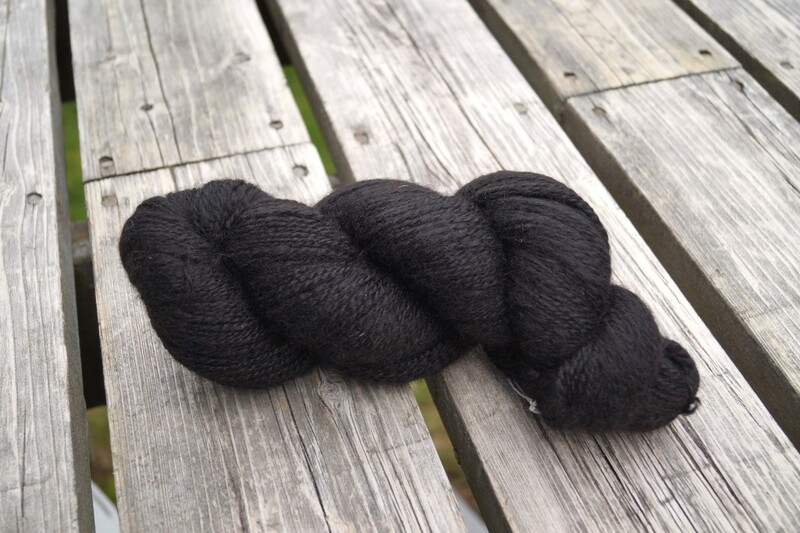 Well after a couple weeks of washing, carding and spinning 2 ounces of his lusciously soft and silky fibre, it turned into a gorgeous jet black skein of yarn just begging to be petted and smooshed. Trust me, ask anyone who knits or crochets what they do when they pick up a pretty skein of soft yarn and you will understand our crazy ways. 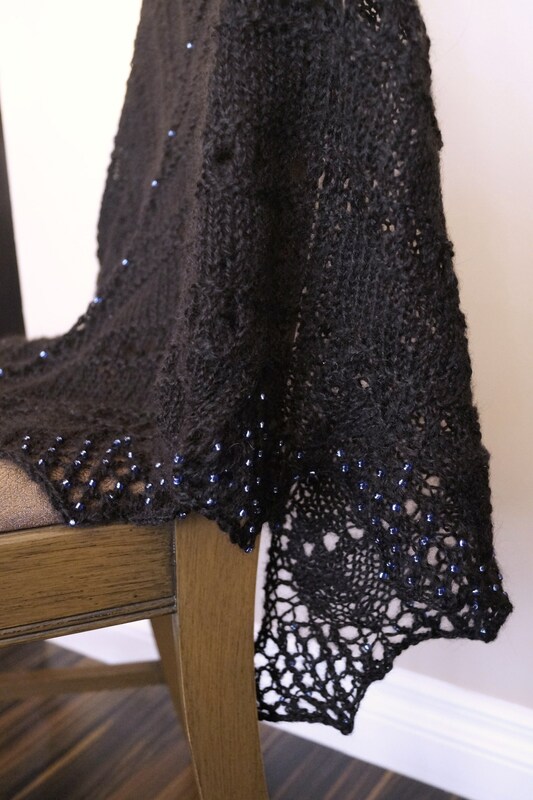 Smooshing aside, in my minds eye, I envisioned knitting a soft and drapey shawl that would wrap around me like a warm hug on a chilly evening. 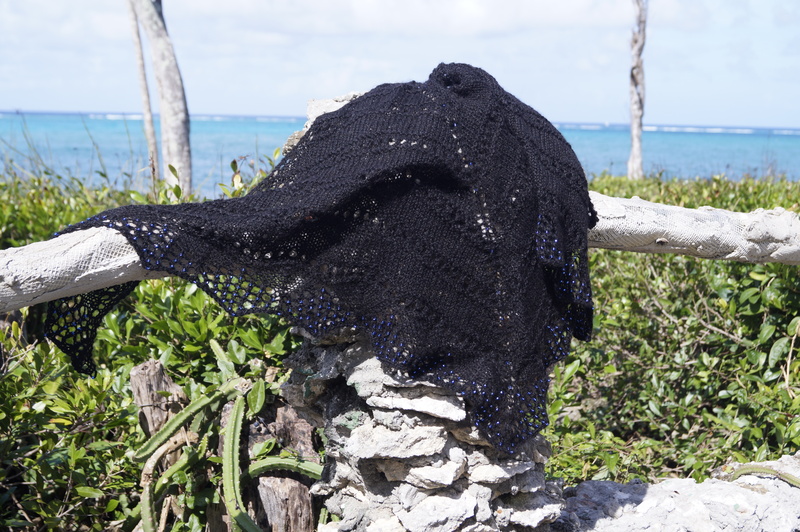 Especially given that we had just booked a trip to Cuba for January 2018, so there was some urgency in finding and knitting a shawl in time that I could take it with me. Once I settled on “what” to knit, it was time to look for the perfect pattern on Ravelry that would showcase the lovely fibre. It couldn’t be too complicated a stitch pattern as the black fibre would make any intricate stitch definition disappear, rendering it a total waste of time and energy, but I finally settled on a simple pattern with a scalloped lace edging featuring hundreds of tiny seed beads set in like iridescent blue stars against a jet black sky. Knitting didn’t take too long as the first 80% of the shawl was a somewhat boring knit, but boring was good as I was soon going to be challenged in the final outer lace pattern section with painstakingly inserting the many teeny blue beads onto stitches as I knit along each row. This definitely took a boatload of patience, but it was so well worth it. This is just the second time I have ever knit with beads and I think I have had my fill (bet I change my mind though when I see a lovely pattern with beads I just have to knit), but for this project, I thought the chosen pattern was how to best show off the qualities of Fuerig’s fleece. 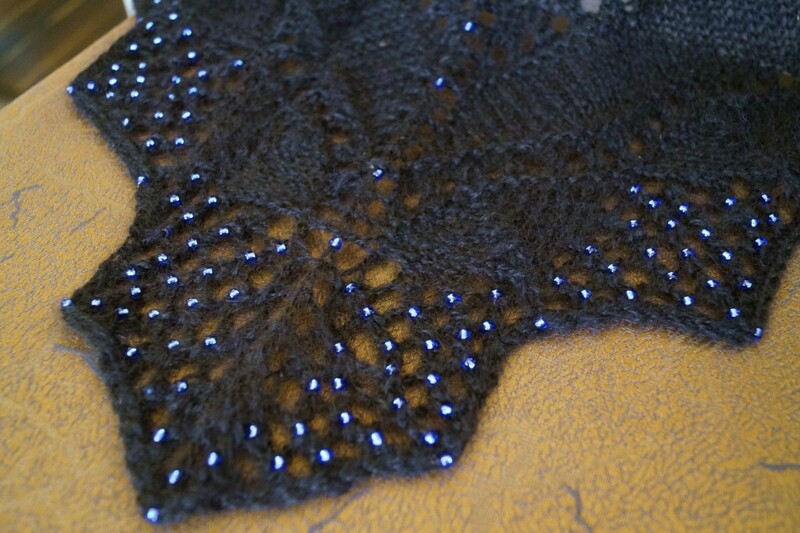 Once the shawl was complete, I spent considerable time trying to capture a decent photo. Ha! Ask anyone who has ever tried to photograph a jet black object up close and they will tell you, it’s hard! Indoors or outdoors, with a flash or without, bright sunny day or a cloudy day, it was all proving very difficult. There was going to be lots of time spent in photo editing land I feared. About 50 shots later, I ended up with a couple of ‘decent’ photos and I wholeheartedly admit, I am not a professional photographer so I best not quit my day job. 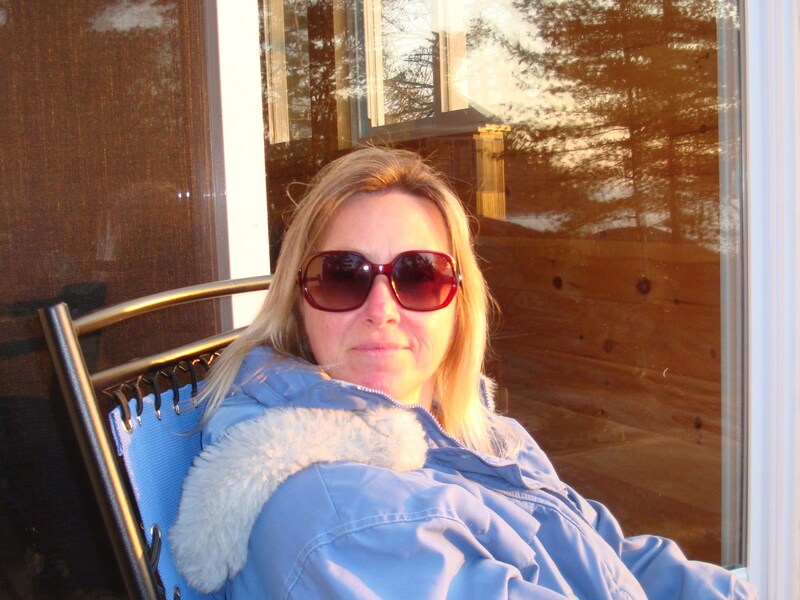 With the shawl done, I began to count down the “sleeps” until hubby and I were whisked away on a plane to Cuba. I carefully packed the shawl (along with a few others I have done in the past couple years) into my luggage all the while hoping and praying the airline wouldn’t lose my suitcase. I just couldn’t fathom not ever seeing the shawl again after all the hard work of washing, carding, spinning and knitting the fleece from such a beautiful animal. I ended up wearing the shawl on our last dinner night out at the Mediterranean restaurant, which was absolutely divine and I felt like royalty with the lusciously soft fibre draped around my shoulders. 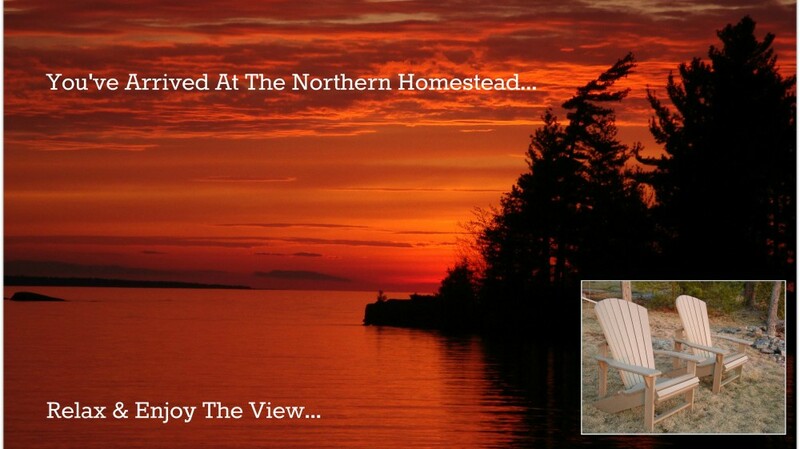 It would have been great to have a photo of me wearing the shawl or the shawl alone in a sunset photo, but the location of the resort geographically made that impossible as the sun was setting behind the resort and not over the water along with dinner reservations were set for long after the sun had gone down. So, best I could do was to try and photograph it with the pretty backdrop of a Caribbean Sea. I simply adore how this turned out and know this will become a treasured heirloom in my family. I still have several pounds of Fuerig’s baby fleece carefully tucked away so now it is time to explore what else I can use his sillky, soft fibre for…..other than smooshing.